Today was the big day. Today was the day that tickets to Edel '15 went on sale. Maybe you bought one. Maybe you didn't. Maybe you wish you could go but you can't. It's a conference for moms and you aren't even married. You would much rather have a quiet time of prayer than a loud dance party. Even if you could swing the $280 ticket there's no way you could pay for the hotel and the air fare. $1,000 is what it would take for me to get to Charleston and attend the conference. Unless someone suddenly asks to fly me to the area to speak on JF's miracle the evening before or after Edel (which is one of the ways I was able to attend Edel '14) I will be staying at home, wishing I could be with Jen, Hallie, Kelly, Rachel, Jenny and the rest. So what if I pretend that* if only* Rachel Balducci lived next door to me she would be my bff / mentor mom? That's not weird. It bums me out a bit, I won't lie. The Edel Gathering is an amazing experience and some of my favorite internet people are going to be there. I wish we had the money, but we don't so I won't go. And you know what else I won't do? I won't rag on the event or the people who are going. I won't gripe about the cost or belittle the gathering. It takes a lot of money to pull off something as nice as the Edel Gathering, but there are cheaper events in our dioceses so maybe you and I can attend those. Or maybe you'd enjoy FOCUS' Seek'15 Conference that's coming up. Jim Gaffigan will be there and honestly, I wish I could be there too. A quiet day of prayer is more your speed? The Sisters of Life have some really awesome retreats coming up - maybe you can make one of those. Jen and Hallie, thank you for all the work you are investing into the Edel Gathering. Thank you for doing this to build up your peers and to glorify God. To all the women who are able to attend Edel '15, I hope you have a blast. I will be praying for health in your homes, safe travels, renewed spirits, warm hearts, and a lot of fun for you. So kind of you Bonnie! I am praying it is a blessing to the women who are able to be there too! Yet again, Bonnie, you said it. You're just my favorite. Congrats on another gathering Jen & Hallie! Although I don't have the same sentiments about not being able to attend the EDEL gathering (money and the lack of marriage and motherhood all being the reasons) - I really needed the read your post today. There are so many things I'd really love to do - but being bummed does not require me to also complain. Separating out those two things is a good spiritual exercise for me! Thanks for the reminder! Amen! Second year in a row that I won't be attending... but the money just isn't there, so maybe God knows that someone needs the ticket I would have used even more. I hope that everyone who goes has a wonderfully blessed time, and I'm crossing my fingers that there will be an affordable (for me!) Midwest option sometime soon! Hi, Francine! I stalked you for about 2 seconds, but I'll just jump right up to being nosy. Where are you at in the Midwest? I'm SW MO! 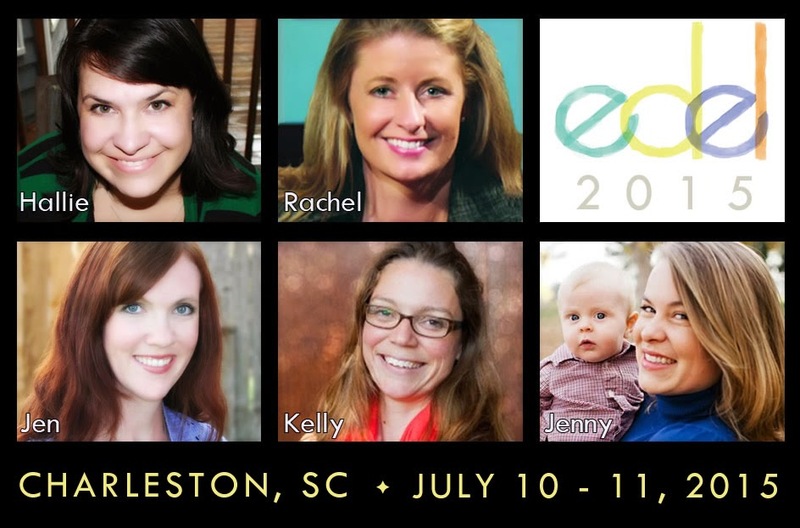 I would love to meet all of the women gathering at Edel, especially since when I just get snippets of them (vlogs & podcasts and such), I always, always love them even more. I can't imagine how I would feel being amidst so much awesomeness in the real flesh & blood. This is the 2nd year I've decided we can't "afford" the conference. To be honest, we have plenty in savings & I could even easily save up money on the side from my freelance work, but the peace I get in paying down debt so that my position at SAHM feels just a bit more secure---the conference just isn't alluring enough for me to part with that peace I earn by being a steward of my money this other way. Um bonnie. It's like you wrote this for me. I REALLY wanted to go this year. I thought it would be good for my spirit and good to be around other Catholic bloggers/moms. I just thought it would be good. But the 281 was steep and then the travel/hotel/expenses while there would be too much (like you, about 1000k). The ol' husband and I are trying to secure a move and we just don't have the 'extra' right now. But then I apologized and I realized this isn't the year, but next year might be. So anyway, thanks for writing this! As an introvert, the thought of attending such a gathering is a bit terrifying :) But there are plenty of other opportunities that I feel bummed out about and am having a hard time not being sour grapes about. My in-laws just got back from a very expensive trip flying around half the world. I don't want that trip but I would love to be able to take my kids to Rome. But I will try to follow your example and smile nicely through all their photos at Thanksgiving. Pretty much in the same boat here. I wanted to attend this year from the moment it was announced, which is unusual for me. We couldn't swing it, but I told myself "next year, next year!" Well we can't make it happen for next year either, and I was feeling pretty bummed today as well. But I do feel good about not spending the money, I know it's the right decision so that helps. Thanks for sharing! We don't have to feel like we're the only one not going. Edel 16! Lol. I just love you Bonnie...thank you for being so you. Bonnie - Edel (for me) will not be the same without you. I am going to start praying for doors to be opened for you to go. God's will be done either way, but just know that I'm good at nagging the Lord. ;) Love you! So needed this too, Bonnie! I could actually drive...it's maybe a 10-11 hours. But gas/tolls/hotel/parking fees in Charleston plus Edel ticket price? No can do. I just can't justify it. I agree with your friend above, that using the $ in savings or recent earnings toward bills is much more edifying right now. Yup, yup! I'm so happy for all the women who are able to attend. And I know the money is to help cover costs. I've helped put on events like that and they take an enormous amount of work and money. I'm just hoping they post the talks like they did this year :-) LOVED that! I agree with you. As much as I want to go, it would be horrible to trash on the event or be negative about it. I was actually planning to go...I have a room reserved (that I need to call and cancel, actually). But once the price of the ticket came out and I started doing the math, I just couldn't justify that cost on something just for me. Even if I wanted to say it was my birthday/anniversary/Christmas present -- well, I never actually get those anyway, so it's still not quite something that works for me. I first read this post a few days ago and had to think on it before I came back and commented. I totally agree with you about not complaining or being bitter. I think for me, the realization came when I realized that I likely "never" be able to go to Edel barring the unusual circumstance that it actually happns in my own town. And that's okay. The creators of Edel chose to make it a more elaborate expensive endeavor because that is what they wanted and that is well within their right to do so. If I were creating a conference I would likely do things differently...maybe at a retreat center..someplace much more affordable, but not as posh. But they aren't me, and that's fine. If I really wanted to put the work and effort in to create something more affordable I suppose I could...and maybe someday I will. Maybe. Until then, I just have to accept that Edel is something that is supposed to be more elaborate and expensive because that is the way they wanted it and that's totally okay. They have no obligation to make it "affordable" or"accessible" to everyone. cost more than Edel! I want to go to both so badly, but it ain't happening this year. C'est la vie!